One of the greatest weapons against tyranny is memory. The Soviet era illustrated this in no uncertain terms, when purged officials were literally excised from history books and newspaper records. Yet again, history repeats itself under Putin. The Commissar would very much like the general public to forget the assassination of his leading critic, Boris Nemtsov, but that will not happen under Grigory Saksonov’s watch. 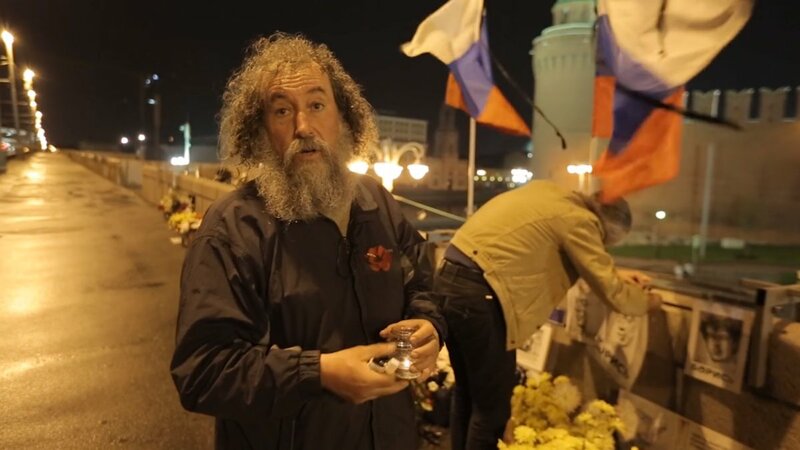 Ivan Makachev profiles the leader of a hardy band of volunteers who guard the memorials to Nemtsov that still adorn the site where he was gunned down in the short but significant documentary Nemtsov Bridge, which screens as part of this year’s Brooklyn Film Festival. Saksonov was always committed to building real and meaningful democracy in Russia, but he took a hiatus from activism to protect his mother. She had been fired from her job to punish him for speaking out against the Putin regime. 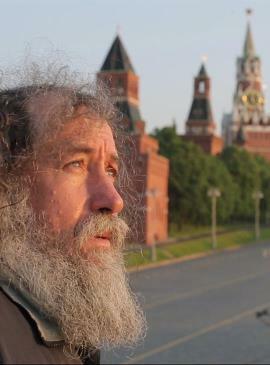 After her death, he recommitted himself to the cause of democratic reform, most notably by defending the makeshift memorials on the Bolshoy Moskvoretsky Bridge from Putin’s thugs. While on duty, Saksonov often engages with pedestrians, including younger Russians who seem depressingly inclined to forget and/or deny the past. Judging from the film, Russia’s Millennials might be even more disappointing, and disinclined to protect free speech, than our own. Yet, Saksonov is always respectful. Indeed, Makachev’s subject is a truly inspiring figure to meet. The last time we see him, he is getting roughed up (to put it mildly) by the cops during a March 26, 2017 demonstration. The man is committed and the truth is on his side, but it is unclear whether it will ultimately set the country free. Makachev’s commitment is also impressive, considering he revisits Saksonov several times over the course of nearly two years. Very highly recommended as cinematic journalism and a profile in courage, Nemtsov Bridge screens as part of short film programs this Sunday (6/3) and next Friday (6/8) during the 2018 Brooklyn Film Festival.